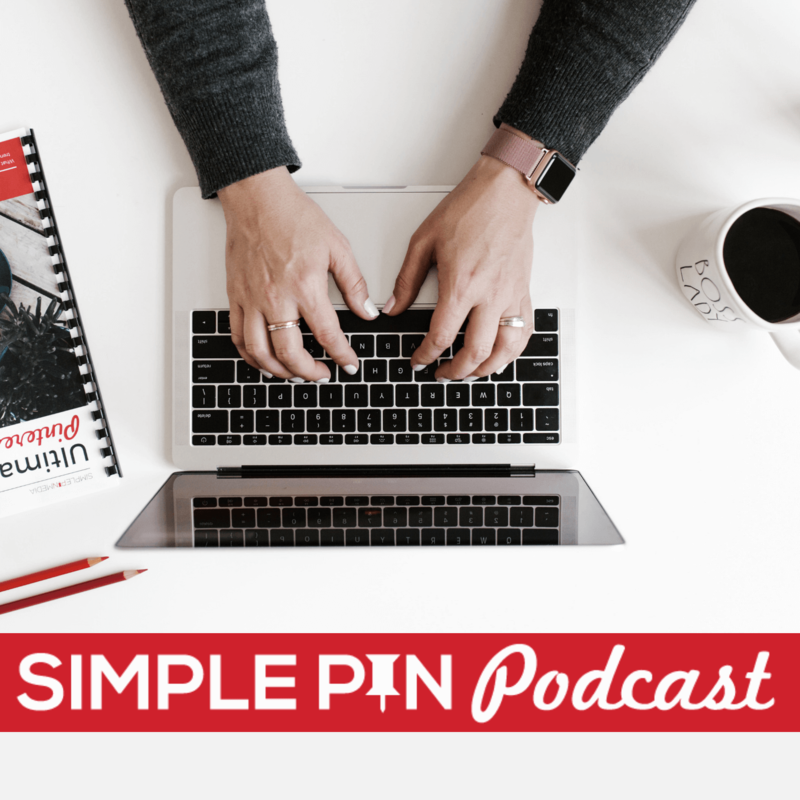 If you’ve been listening to the podcast for a while, you know that I love to teach simple tips to help you move your business forward, without all those overwhelming feelings that your mile long to-do lists give you. So today, we’re going to be talking about September Pinterest trends. It’s time to learn about what you should be pinning in September, and what keywords and searches are really going to help your business grow this month. Pinterest is a search and discovery platform. I encourage you to get on Pinterest as a user and you’ll see exactly what I’m talking about. I use Pinterest for my own personal use, to search for things such as recipes, goals, purchases for my home, and so on. It helps me accomplish my goals. And so if you are using keywords in your pins for the content that you are creating, it will help me, the user, find your pin if it’s relevant to what I’m searching for. September is a time when we see a lot of searches about Fall. Pumpkin spice…need I say more? People, including myself, go pretty crazy for anything pumpkin. So if you’re a food blogger, think pumpkin, squash, apples. Slow cooker meals, soups and stews are also super popular in the Fall. With Fall comes football. I may not be a huge fan personally, but it’s playing in my house. With football comes tailgating, Friday night lights, appetizers, and a lot of partying. So if your blog is more geared to family and lifestyle, these are things you can think about when blogging. Who doesn’t love a good party? And Fall parties are some of the best. Think harvest, bonfires, hayrides. Kids love Fall parties. Speaking of kids, they also love crafts. Why not cut out some leaves, or if you’re in Vermont, harvest some of that delicious maple syrup? I know that’s something I would love to do. What should you be pinning now? Think about what people are typically doing in the Fall months. I’m recording this in August and it’s still hot, hot, hot outside. For me, I’m aching for the organization that comes with Fall. My kids go back to school, we get settled into a routine, and the lazy days of summer come to an end. I don’t know about you, but as much as I love the lazy days of summer, the piles of stuff that my house accumulates can be a bit much. Pinning about household systems and routines is a smart move right now. Along with letting ourselves get lost in the chaos of summer, we sometimes allow our budget to do the same. So a lot of people are wanting to get back to sticking to their household budget, as they start gearing up for Christmas. Think about how you can target this audience and help them get on the right track. Before you begin creating brand new content, think about what you’ve already published. Be thinking about what you already have that you can update so that you don’t add any extra work to your plate. Especially if you’ve been working really hard to pump out new content over the last few months, see what you can reuse and repurpose, so that you don’t get overwhelmed as we head into the busy 4th quarter. That might mean republishing some posts. Updating and optimizing that older content is a super smart move and a good use of your time. Back to school. I know that many of you are already back to school, but there’s always that need to really get back into a routine. Don’t stop pinning back to school stuff just yet. It’s definitely still beneficial. Think about those of us whose kids still have about four weeks before they go back to school. There is still a good target audience there. Let’s talk about gardening. I know there are a lot of people who garden, process, and can in September in preparation for winter. Maybe you have a specific vegetable or fruit you can talk about canning, with a special twist. Gluten-free or low sugar, anyone? Also, if you already have posts about how to help the garden transition from fall to winter, bring those out of the archives. Show everyone that you have those posts and that they’re a good resource. Fall weddings are huge. If you produce any content that’s relevant to the wedding industry, whether it’s about hairstyles, nails, decorations, or cakes, go ahead and get those pins out there pronto. Do some research about how long typical engagements are to know when to really start pushing those fall wedding pins. Meal planning. This goes back to the organization that I talked about earlier. Think about how you can help get people prepared for the week or offer shopping hacks that can save time. Does Costco content work well for you? Do you prepare your meals weeks in advance? Do you write about freezer meals? Pin them to help people organize their meal planning. Everyone loves tips that make their lives a little easier. Because it takes your pins a little while to get into the smart feed, you need to be pinning well before the holiday is upon us. Everyone’s home feed is different and is shaped by their past pinning behavior (which signals to Pinterest what content you’re interested in). For example, if someone pins something about cats, chances are that I won’t see it, because I’m not pinning about cats. Pinterest sees that I’m not pinning about cats, so they don’t show me what I’m not interested in. You can start pinning about Thanksgiving and Christmas in September and October but it would mostly be prep work. Before those holidays comes Halloween. Halloween is huge for some people. We talked about this with Jillian Tohber Leslie of Catch My Party in Episode 42 (all about Seasonality on Pinterest). She shared that her highest traffic time is before Halloween, so in September, she pins Halloween like crazy. She takes advantage of the traffic patterns that naturally occur on her site each year and really studies what her audience wants to see. Take a cue from Jillian and study your analytics to learn when your high traffic time is, and then pin about four to six weeks before that time. The one exception to this is Christmas. Christmas does not stick to the same pinning schedule as other holidays. Think about all of the DIY blogs that focus on gifts and handmade items throughout the year. Those types of blogs can pin for Christmas all year because their focus makes sense. You can pin Christmas at anytime, but don’t make it your focus unless your content calls for it. But I Don’t Have Any of This Type of Content! So what do you do if you’ve listened to this podcast and you’re thinking, “Okay, I hate pumpkin spice”? What do you do if you have none of types of content that I’ve talked about? Guess what? I don’t have it either! Instead, Take this opportunity to sift through your Google analytics and identify what posts are consistently bringing you traffic throughout the year. Update and optimize these posts. They don’t have to be your top posts, they can even be number 10 or 12. For example, I just did this recently with one of my group boards posts. I used to do a Q&A Friday post and that was a good way for me to gather data to create an editorial calendar. I no longer do that now that I have my podcast. But because I still get questions about group boards, I updated this post by answering the questions I’m currently asked most frequently. The graphic on the post said “Q&A Friday” on it, so I had my creative director, Tina, create two new images for me. She even went the extra mile and created a special UTM code for me with step-by-step instructions. The UTM code is a Google tracking code for the specific images. So I’ve updated and optimized those images and will be doing a podcast about the UTM codes in the future. If you have content that is valuable, dust that content off. It may need links added or some newer images, but utilize what you already have. And a word of advice about Pinterest boards — just leave your boards where they are. Right now, the process of moving boards can be really glitchy and since most people no longer visit your profile, focus on just getting pins circulating. It’s also a GREAT TIME to test out promoted pins. Think of the post that you want to promote. Think of your goals. What do you want to happen when people click through the pin onto your site? Do you want them to sign up for an email list, maybe click on an affiliate link? Figure out that goal and then start your promotion with that goal in mind. So that’s our summary of September Pinterest trends and my tips for what you should be pinning in September. And if fall finds you wanting to try a new scheduling program, be sure to check out Tailwind. In fact, I have an entire course on how to master Tailwind. It’s a little less than an hour and not super expensive. If you’re a new or intermediate Tailwind user, I’m confident that you’ll find the course super useful for upping your Pinterest scheduling game. I hope some of these tips have been helpful for you as you create a strategy for your Fall pinning. I’d love to hear about your favorite Fall pins, and what you’re most looking forward to this Fall season! I love the concept of wedding and meal planning things to get posted on pinterest. Kate, you and your content are amazing but why are you always hating on cats? 😊 Really though, thanks for the great post. I’m excited about your podcast about UTM because I have no idea what that is! Thanks for the list of ideas. I’m so overwhelmed by harvest time that my brain has checked out of blogging. One note on your topic list – the time for harvesting maple syrup is late winter/very early spring, when the sap is rising in the trees in anticipation of the trees leafing out. The rising sap pressure pushes that sap out of the taps, where it is gathered and cooked down into syrup. I have a post on maple syrup making on my site written by folks who run a syruping operation in Vermont, plus I’ve visited a few sugarbushes here in Wisconsin over the years during syruping season. How fun!! I bet this is something that would also be good for travel and when people want to go to Vermont.